At the Animal Clinic of Billings, our veterinarians provide emergency and urgent critical care services for your pet 24-hours a day, seven days a week, and 365 days of the year throughout the holiday season(s) to help you and your pet though any emergency situation that may occur. If you feel your pet ate something poisonous, you can also call the Pet Poison Helpline. Animal Clinic of Billings veterinarian Dr. Massic and veterinary surgical technician Heidi DeGraftenreid perform emergency surgery on a newborn bulldog puppy. Emergencies are never convenient. At the Animal Clinic of Billings, our veterinarians and support staff understand the stress and panic that can come from experiencing a medical emergency, which is why we work diligently to receive and treat your pet as soon as possible. 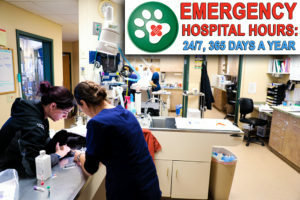 We can accept pet emergencies at any time during our regular office hours and after hours as we have an emergency veterinarian on-call at all times and use an answering service so that you can reach us quickly and easily. Our facility is equipped with state-of-the-art diagnostic and monitoring equipment as well as a surgical suite, allowing us to provide your pet with the best possible emergency care when it matters most. No appointment is required for emergencies or urgent care. Our emergency veterinarians are trained to immediately receive our patients and stabilize them as soon as possible. We do ask, when possible, that you call us ahead of time at 406-252-9499 so that our team can be ready to provide treatment. Whatever the problem, we’ve got you covered. 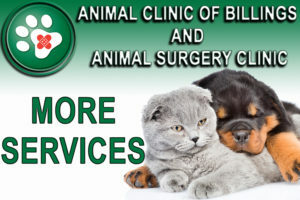 The Animal Clinic and Animal Surgery Clinic of Billings proudly provide the best veterinary care and emergency services available in the greater Billings area, however, listing all of them would be a bit daunting. Rest assured, anything from broken bones, lacerations and seizures, to obstructed bowels, swallowed poison or bleeding, our veterinarians can find solutions to your pets medical emergency. Once stable, your pet can be released to your regular veterinarian for continued treatment and at-home care. 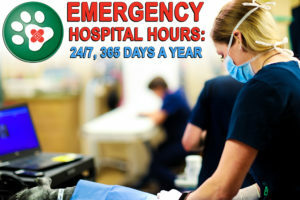 We also offer daytime hospitalization for our emergency patients if needed. 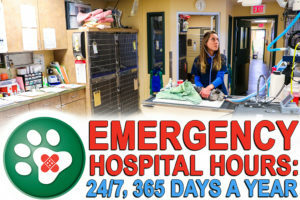 At the Animal Clinic of Billings, critical care and emergency medical services are available 24/7 throughout the holiday seasons and year-round. Please do not hesitate to call us if you feel your pet is experiencing a medical emergency. No matter what the incident, or at what time, if urgent care is required, the Animal Clinic and Animal Surgery Clinic of Billings will be on standby to assist.